My third holiday to southern Turkey this year was hot, very hot, but great fun and as stunning as ever. Our day trips to local archaeological sites remain amongst the most memorable experiences. 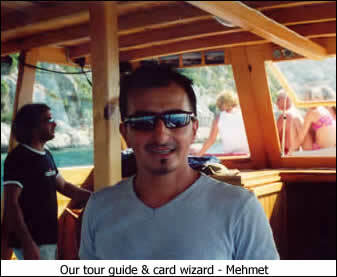 The Turkish people are friendly and hospitable and great fun. Give a full deck of cards to someone in the audience and ask them to shuffle and cut them. Take the pack face down and count out the first half of the pack, turning them face up onto a pile in front of the member of the audience. When you have done this - pick up the 26 cards and place them face down back at the bottom of the pile you have in your hand. Take three cards from the top of the pack and place them face up on the table. Then add enough cards to each (all face down) to make a total of 10. So, if you turn up the 3 , K and 8 you would put seven cards face down below the 3 (as you count from 3, 4, 5, 6, 7, 8, 9, 10), none below the K (since this already has a value of 10), and two cards face down below the 8 (as you count from 8, 9, 10). 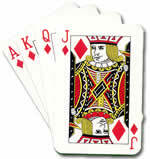 The three cards showing (face up) on the table are the 3 , K and 8 , making a total value of 3+10+8 = 21. You should now be able to predict the 21st card down the rest of the pack sitting in your hand . "And the 21st card will be..."
How is it possible to predict this card no matter what the three cards you turn over are? Working systematically. Programming. Combinatorics. Addition & subtraction. STEM - General. Video. Counting. Logo. Positive-negative numbers. Practical Activity.